" Finding gentlemen like this is what keeps me going....and on my toes. 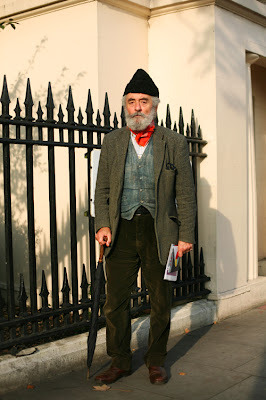 So I stop this gentleman and say I would love to take a photo of him. "Everyone wants to take a picture of me " he replies. When someone says something like that, you realize you are on a short leash and I could just as easily talk myself out of a photo. I have found that the more honest I am with the subject, the more the subject appreciates it. They know they are characters. So I say" I don't doubt it, you're quite the character." That seemed to get him. "Well, hurry up with it then, my wife is waiting" he says and then he stood completely still while I took five or six shots. I always am a little in awe of someone that can stand so still when they are having their photo taken. He didn't check himself, he didn't adjust anything, he didn't ask to see the photo afterwards. He basically just said - here I am, take your best shot." This is why i keep going back to Mr Schuman's web site!